How do I grow a standard fuchsia? In order to grow a standard fuchsia take a new cutting of a strong upward growing variety (see later section for advice). If this is your first attempt use a small flowered variety as these are generally easier to manage with less weight in the head of the standard as it matures. Usually once a fuchsia cutting has rooted you would 'pinch out' the growing, or axial, tip to encourage bushy growth. When growing for a standard do not do this. If the axial tip is left in place all of the plant's energy will go to this one tip and it will shoot upwards. As the plant grows upwards support it with a cane, tied in loosely with twist ties - do not tie too tightly as the stem will thicken and can become strangled against the cane leading to distorted growth. Check the plant regularly and tie in to avoid flopping. Also remove any side shoots that may start to form, but do not remove the large leaves growing straight out from the main stem. These leaves will be providing food for the axial tip as it grows and will drop off naturally. If the tip starts to form flower buds these must be very carefully removed, but wait until they are a reasonable size and the tip as grown past them to avoid any damage. As the young standard (or whip as it is known until the head has formed) starts to reach the desired height be careful about removing the side shoots. Ideally you want to leave about three sets of side shoots below the point where you remove the axial tip. These side shoots will form the head of the standard. Once the tip is removed allow the side shoots to grow out and then pinch them out to start the head forming. The principle is then the same as for promoting bushy growth in a plant grown as a shrub - pinch out the side shoot tips every two to three breaks until the head is formed. Once the head starts to form the 'whip' is now a standard. How do I overwinter a standard? First point - although many hardy fuchsia varieties make good standards, no standard is hardy. ALL standards no matter what the variety need to be kept in during the winter at a minimum of 5ºC, this is because you must keep the plant ticking along and not let it die back. A hardy fuchsia planted in the garden, will die off over the winter and shoot from the base next spring. If you let a standard fuchsia die back it too will shoot from the base and you will end up with a bush the following year. During the winter you will find that growth slows down and for this reason it is important not to overwater as roots left sitting in constantly wet compost will soon rot away, you need to keep the soil just moist, so monitor regularly. A light trim round the head of the standard in the autumn will help promote a good shape for the next year and make it tidier for storage. This will also enable you to see when new shoots start to form in the spring. Once new growth is in evidence a bit of fresh compost and plant food will see the standard burst into life and be ready to give you another year of pleasure. But remember, still pinch out the early season growth on the head for a bigger better standard with even more flowers! How do I overwinter my bush/basket fuchsias? Non hardy fuchsias need to be given frost protection during the winter no matter how they are grown during the summer - planted out, plunged into beds in their pots or just on the patio in pots or baskets. Hardy varieties grown in pots for effect also need frost protection as otherwise the valuable root system will die off. Before the first frosts of winter lift plants from borders and put the root ball into the smallest possible pot. Cut the plants back to one third of their summer size, this makes storing them much easier and will promote vigorous growth in the spring. Fuchsias are naturally deciduous and to reduce the possibility of harbouring pests and diseases we recommend that you remove as many of the old leaves as possible. They will only fall off anyway over the winter and leaf litter in the greenhouse is an ideal breeding ground for all sorts of potential problems. 1) A heated greenhouse or conservatory is the easiest answer, in fact if you can keep it at a minimum of 5ºC the plants will keep ticking over during the winter much as a standard (see above), giving you a bigger plant with flowers earlier in the season. 2) An unheated greenhouse, shed or garage, where the plants can be kept just above freezing will result in them going into a much deeper dormancy. The dormancy will mean that a lack of light will not be a problem, but don't forget about them completely, a light watering once a fortnight to avoid them going completely crispy dry will be necessary. If a very hard frost is expected it would be advisable to give the plants an extra degree of protection - hessian, straw, polystyrene chips, or horticultural fleece will all offer one or two degrees more of protection. 3) 'Laying down' is the old fashioned way of seeing fuchsias through the winter. Dig a large pit in an area of the garden where the ground will not become waterlogged, line the pit with a thick layer of straw. Plants are cut back hard and laid one on top of the other. Another layer of straw is put in place and then the pit backfilled to give a minimum of a 6" depth of soil. The fuchsias are then left until spring. When the plants are lifted from the pit they will most likely have long white shoots, although this means they have got through the winter successfully cut these back hard to promote stronger growth. If you have literally no way of providing a frost free environment it may be best to take a few cuttings in the autumn. These can be grown on during the winter in the house - all it needs is a sunny windowsill, but be careful they do not get too hot once spring comes. How do I take some cuttings from my plant? We would prefer you to come and buy another plant of course! However, many people do want to try their hand at cuttings, and for some it is the only way to keep a plant over winter. There are many different ways of taking cuttings - we opt for tip cuttings taken late autumn/early spring. Firstly prepare your cutting tray in advance of searching for the suitable material. We use a coir based seed compost and firm it into a modular type tray before giving it a good drenching. The modules allow excess water to drain away and make it easier for subsequent potting up. Once rooted the cutting can be pushed up from below giving a good 'plug'. When searching for cutting material you are looking for soft growth, preferably with no buds in the tip. If there are flower buds these will use up energy and it will not root so well. If you only have shoots with buds you can try taking a cutting, but carefully remove the buds without disturbing the axial tip and be prepared that it may take longer to root than from a flower-free cutting. Using a very sharp knife make a clean cut ideally about 1½ cm below the first full set of leaves, there is no need to worry about leaf nodes. Once the cutting is taken transfer to your cutting tray as soon as possible. You want to avoid the end of the cutting drying out. Dip the end of the cutting in rooting powder (available at most garden centres), then make a small hole with a cane, pop the stem of the cutting in and firm the compost back against it. Try to avoid any air pockets as this will cause the stem to dry out and it will not root. Providing some heat under the cutting tray will speed up the rooting process. You can expect to see results as early as 14 days in spring, or allow up to a month in the autumn as daylight hours shorten, gently mist the cuttings each day to avoid drying out. Once the cutting has rooted you will see tip begin to grow, it will appear as a lighter green after a couple more days the plant can then be pushed out and potted up. Can I keep a hardy fuchsia outside in a pot over winter? No, is the simple answer. It is the rootball of the fuchsia which is hardy, the top of the plant will die back during the winter and the fuchsia will shoot again from the roots in the spring. If left in a pot the frost can attack the roots from the side and the plant will die. Try to plant your hardy fuchsias directly into the ground in an area that will drain well during the winter. If you want to grow them in pots then they must to be treated as tender varieties and kept frost free. What should I do with my hardy fuchsias? Planting them out - Hardy fuchsias need to be in a minimum of a 9 cm pot before being planted into the garden. In fact the larger the plant is before transplanting the better chance it has of survival, so grow it on in a pot for a while if possible. To become established enough to withstand the winter the plants need to be in the ground ideally at least two months before the first frosts are expected. Many books advocate planting them 3" below the soil level in their pots - perfect if you have a large plant, but often when setting up a border with young plants this would mean burying them completely! A simple solution is to dig a shallow dip and plant the fuchsia in the bottom. This dip can be backfilled as the plant grows up leaving the rootball lower in the ground. Additionally it will help moisture to be retained at the base of the plant after watering during the summer months. Remember that a newly planted fuchsia will require a bit of care over this first season to get established. Once they are well rooted fuchsias will generally care for themselves except in extreme drought conditions. Overwintering - For the first winter consider mulching around the base of the plant with bark chippings or straw. After the first frosts you will find that the top of the plant has died off. If the plant is very untidy it can be lightly trimmed, but leave as much of the dead wood on as possible. This is twofold - firstly it will indicate where your fuchsia bush is over the winter, secondly the dead wood will protect the crown of the plant from frost as well. In the spring once the frosts have finished cut the dead wood to about 4" above ground level. This will promote young vigorous growth and give the best possible display in the summer. After the first winter the plant should not require any additional mulching as it will be well established, but don't be afraid to cut back hard each and every year for the best results. How do I plant up and grow a hanging basket? For best effect only use one fuchsia variety in a basket. This is because different varieties mature and flower at varying rates which can lead to a straggly display. If you want to break up the plants it is better to use something else altogether as a background for the fuchsias. Whichever route you go down make sure that the fuchsia variety you have chosen has a naturally lax habit. It is best to plant up your baskets as soon as possible in the new year, with plants grown from autumn cuttings grown on into 9 cm pots. For a 30 cm diameter basket you will need 5 plants, odd numbers of plants generally give a better shape to the finished basket. When planting the basket rest it on a bucket or similar to support it. It is best to incorporate some water retaining gel and some slow release fertilizer at this point, mix thoroughly with the compost to ensure even coverage of the basket. The basket should remain in the protection of a heated greenhouse until all risk of frost has passed. It is best if left down on the bench as it will not dry out so readily and is easily available for pinching out to promote bushy growth. Once the basket is hung out into its summer position be aware that the additional air circulating around it will cause the compost to dry out more quickly than ground level pots. Baskets should be checked at least once a day - preferably twice in very hot weather. Another consideration is that due to the extra watering, they are more susceptible to leaching out of vital nutrients and they may require feeding more often during the flowering season. One word of warning though - baskets do require extra watering but make sure that there is still adequate drainage, you do not want the basket to become completely sodden as the roots can then start to rot. What pests and diseases affect fuchsias and how do I combat them? Fortunately there are not many pests and diseases which affect fuchsias. The important thing here is vigilance - acting as soon as you spot a problem is the best advice, don't let a small problem escalate. Fuchsia Gall Mite - Unfortunately this pest has recently become apparent in the UK. Endemic in the US and Europe for some time the reason for the spread is unknown. Fuchsia gall mite is a microscopic creature that infests the new growth at shoot tips. Sucking on the sap they secrete chemicals which prevent normal leaf and flower growth, leaving a mass of yellow/green/pink distorted tissue. 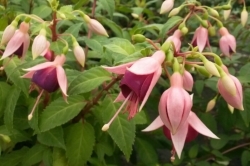 Pictures of damaged plants can be found on the British Fuchsia Society website, where a leaflet explaining how to deal with this pest can be downloaded. At present there is no effective insecticide available. The only method to stop the spread of this pest is to cut out the damaged growing tips and burn them. If you have hardy fuchsias in the garden that have been affected in this way, it is recommended to cut them down to ground level each Autumn and dispose of the tops. PLEASE DO NOT take any suspect infectious material to your local fuchsia nursery! Whitefly - Probably the commonest problem to affect fuchsias; if you have seen one whitefly assume there are more and act quickly - they can multiply with extraordinary speed. It is relatively easy to see whiteflies on infested plants, especially if a plant is disturbed, when clouds of small white-winged insects will fly up. There will also be a sticky honeydew, which if left will develop into a black sooty mould and flat oval scales on the underside of the leaves. Wet sprays can be used when there are no flowers on the plants. Any proprietary whitefly spray used at the correct dilution should be effective, but do check the label to ensure it is safe to use for fuchsias. The only downside to spraying is that it will only kill the adult whitefly and therefore regular sprays at intervals of 3 - 4 days will be necessary. If the plants are heavily in bud or flower then wet spraying will mark the flowers. A preventative form of treatment can be the use of the insecticide Provado. This breaks the life cycle of the whitefly and therefore one dose early in the season when the plants are growing vigorously usually provides protection for a number of weeks. Provado is available from most garden centres. Red Spider Mite - Red spider mites, are not actually spiders - even though they spin a web. They are barely visible to the naked eye and despite their name they are normally green when most active in the summer months! They live from the sap drawn from plants by sucking at the underside of leaves and if left unchecked can do substantial damage, but the main problem is that they are virtually impossible to detect until a problem develops. The symptoms are leaves turning bronzy and very brittle, this coupled with quickly forming fine cobwebs should alert you to the problem. Isolate the infected plant. Pick off all the leaves and throw them away - do not put them on the compost heap. Treat the plant with a good proprietary spray and leave isolated until fresh growth returns and it is clearly over the attack. After an attack all the plants in the greenhouse should be sprayed as a preventative measure, but again take care if heavily in flower as it can cause marking. Red spider mite thrives best in very hot dry conditions, so keeping the humidity up in your greenhouse should offer some protection. Vine Weevil - A secretive insect, not often seen during the day. Early symptoms are notches appearing on the outer edges of the leaves due to the adults feeding at night, later symptoms are complete (and apparently healthy) plants just keeling over, due to the root system having been eaten by the larval grubs. If you suspect vine weevil presence check each pot carefully. Knock the pot off gently and the white grubs can usually be seen in the compost at the side of the rootball it is then possible to remove and crush the grub. Early season use of the systemic insecticide Provado can work as a preventative. By drenching the compost in actively growing pots of fuchsias Provado will kill off any eggs that may have been laid or maggots that start feeding on the roots. Rust - Although this disease will not cause the death of a plant it is very disfiguring and extremely contagious. The first sign noticed is often a yellowing patch on the upper surface of the leaf. On turning the leaf over bright orange spores are present. Remove all infected leaves very carefully. The spores spread in the air so careful removal will go a long way to preventing contagion. Throw the leaves away do not compost as the spores can also live in the compost and remain dormant for some time. Once every infected leaf is removed scrape off the top surface of compost in the pot and replace with fresh. Spraying with a reliable fungicide is the only option. Regular spraying early in the season will provide protection throughout the summer. Rust thrives where there is poor air circulation, if you experience difficulties in getting this problem under control you may have to temporarily thin out your fuchsia collection until the rust is eradicated. Botrytis - Sometimes known as 'damping off' this disease is characterised by grey mould. Overcrowding, overwatering, poor air circulation or leaving old leaf litter lying around, are all factors. The plant is literally rotting away. Addressing all of the above problems will usually effect a cure. In severe cases a dose of fungicide may help matters along. Yellowing leaves - Not really a disease at all, it can be caused by simple old age, overwatering or underfeeding. The latter two can easily be remedied. If it is old age, take cuttings to rejuvenate stock and throw the old plant away.